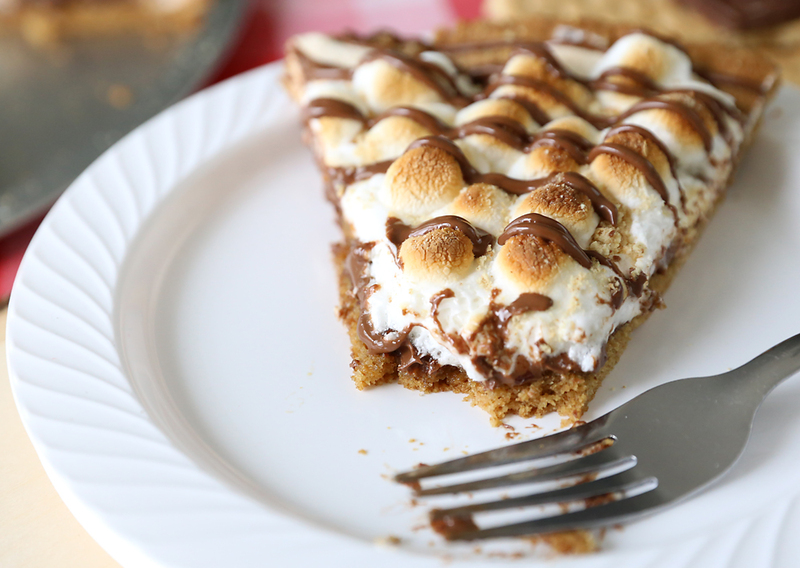 In today’s post: S’mores pizza is the perfect way to get your s’mores fix without using a campfire! Like pretty much everyone else in the world, I love s’mores. I make them over a campfire, I make them in the microwave, and I’ve even made them by toasting marshmallows over the burners on my stove. 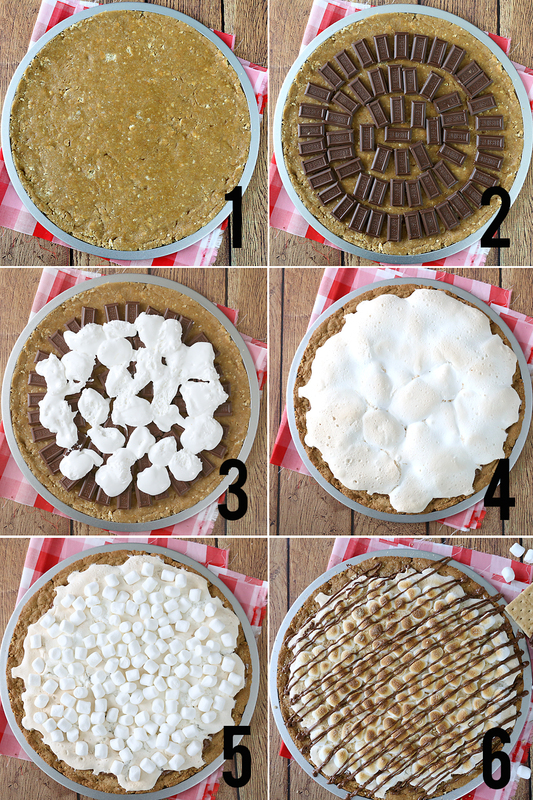 But as a mother of 5, I have one beef with s’mores: they’re too hard to make in multiples. And when I want my melty toasty treat, I don’t really want to have to make (or help make) 5 to give away before I get one to eat. 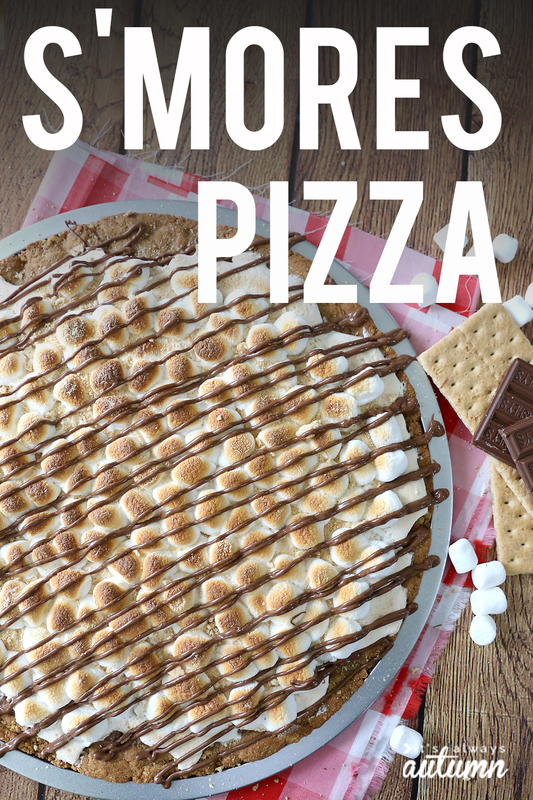 So the s’mores pizza was born: a way to get the taste of genuine campfire s’mores in one big batch in your oven at home so everyone gets to enjoy the hot, toasty, chocolatey goodness at the same time (and you don’t end up smelling like a campfire!). Super, duper, YUM. 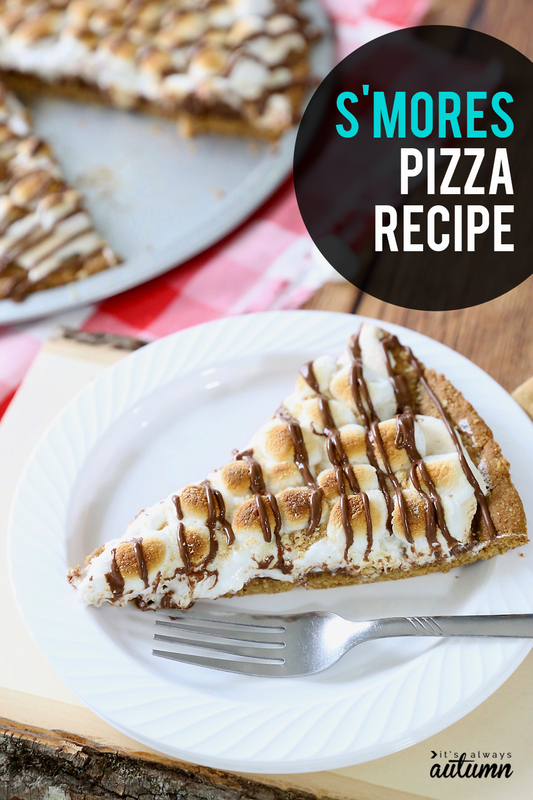 Unlike other s’mores pizza recipes, which use refrigerated pizza dough as a base, this one has a graham cracker cookie crust, making it taste a lot more like an actual s’more. 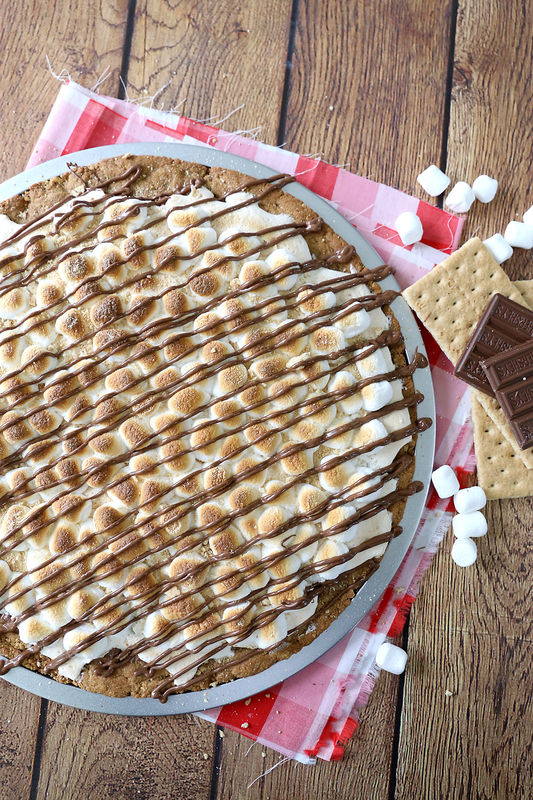 It serves 12, making it a great dessert for a family bbq or summer get-together. 1. Mix up the crust ingredients and press into a 12 inch pizza pan (mine’s from the dollar store and works perfectly!). Break up 7 Hershey’s bars and place on top. 2. Dollop out a 7 oz container of marshmallow cream using two spoons – just like you’re dropping cookie dough. Don’t get too close to the edge of the crust or it will overflow when baking. 3. Bake for 17-18 minutes. The marshmallow cream will puff up and get a little toasty on top. While it’s baking, measure out 2 cups mini marshmallows and break up remaining chocolate bar and put it in a ziplock bag. Melt chocolate in the microwave. 4. 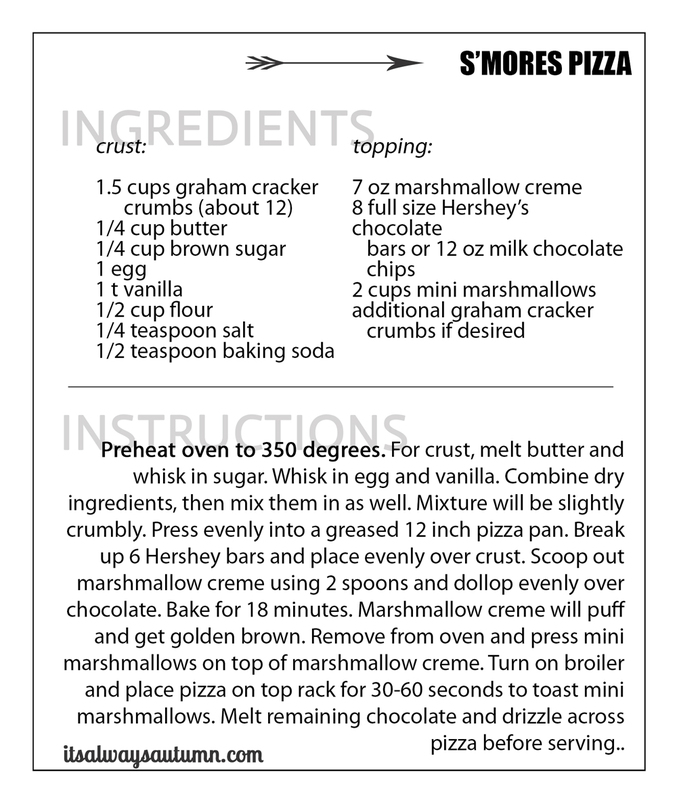 Pull the pizza out of the oven and top with mini marshmallows, pressing them down into the puffed marshmallow cream. 5. Broil for a minute or so to get a toasty brown color on the mini marshmallows. 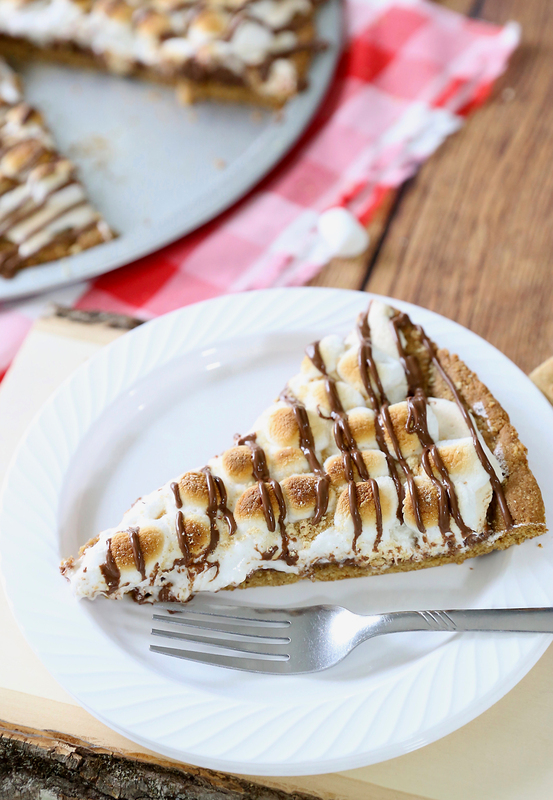 6 – Snip a small hole in the corner of the bag of chocolate and drizzle the rest of the chocolate across the top of the smores pizza. Sprinkle with additional graham cracker crumbs if desired. Now, when it comes to the broiler step, please don’t put it under the broiler, shut the oven door and leave. Broilers work so quickly that the pizza may only need 30-60 seconds to get the marshmallows toasty. Just watch it closely and take it out when you think it looks good. It’s best to let it rest about 5 minutes before slicing. I sprayed a pizza cutter with nonstick spray before slicing. You can also use a plastic knife. The crust will be crunchy at the edges and slightly soft in the middle, and everything else will be melty and gooey. 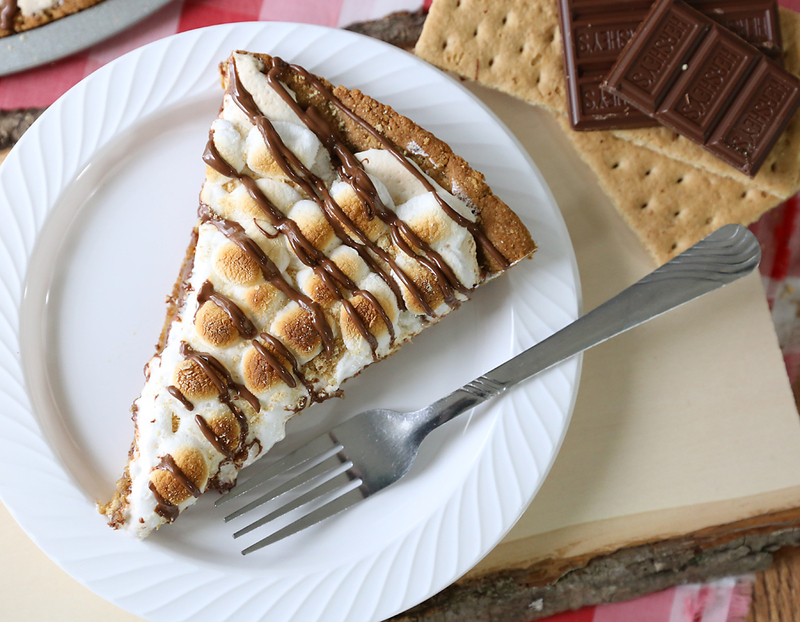 Multi-serving s’mores perfection. YUMMY!! This looks so delicious, thanks for sharing! I think I am the only one on the planet that doesn’t like S’mores. However, the awesome Mom that I am, I have made & help make them for the family. This recipe will now be replacing the original one. Can’t wait to surprise everyone with this! Such an awesome mom! They’ll be so excited! I think I’m going to remove you from my RSS feed! Seriously, how is this going to help me regain my pre-baby shape? And the keyboard gets so sticky when marshmallows are involved! But you are my kids new favorite blogger now! Ok, you had me worried there for a minute 🙂 Then you had me laughing! “But as a mother of 5…I don’t really want to have to make (or help make) 5 to give away before I get one to eat.” You, are a woman after my own heart. As a fellow mother of 5, I think this is pure genius. I’m not a fan of fluff, do you think it would work with regular marshmallows? Laura – I actually tried this with regular mini marshmallows first. It tastes good, but the marshmallows get very sticky and make it really hard to cut nicely. Also, once they cool completely they get a little tough. They really just don’t bake as well as fluff does, but if your group will eat the whole pizza right out of the oven (like my family did) and don’t care if it doesn’t look as pretty, then go for it! Hey guys now it is easy to know how to play dvd in window 10, There is number of results available for same but we provide an easiest way to do that. Thanks for sharing this amazing recipe will definitely try this one.